ON DISPLAY at the NEWPORT BROKERAGE BOAT SHOWSept. 13-16, at the Newport Shipyard, Newport, RI. RAVENOUS II, an exquisite blend of form meets function, was built by a seasoned yachtsman as his second Oyster. His objective was to create a vessel that was safe and comfortable for his large sailing family, with a shallow draft to allow for exploring the Chesapeake Bay and islands, while still presenting as a worthy competitor in Oyster Regattas. No expense was spared in the build, and all objectives were exceeded with flying colors. Seamlessly incorporating the classic and contemporary, RAVENOUS II is an iconic presence on both the U.S. eastern seaboard and Caribbean circuit. She sports a Flag Blue hull and a white carbon mast with V-boom, a head-turner in any port. Her African-inspired interior features maple joinery with rich mahogany accents, beautiful teak soleboards and plush upholstery, all of which combine to accentuate the light, airy interior. Her upper salon and nav area offer expansive views via the deck saloon windows. The equally inviting lower saloon serves as a breakfast nook, reading and lounge area. Her three generous en-suite guest cabins, equipped with hideaway pipe berths for additional accommodations, offer comfort, storage and entertainment for owner and guests. Generous crew quarters and galley forward naturally provide privacy and separation while ensuring the boat is configured for silver service. The versatile deck layout allows for multiple functions, from a competitively-crewed race program to a shorthanded passage. Her spacious cockpit is outfitted to host a multitude of guests for après-sail cocktails to spontaneous alfresco dining on a moonlit evening. Her carefully-chosen top-of-the-line deck hardware perfectly delivers performance when the owner wants. Crewed and maintained by a knowledgeable captain, and refit to the highest standards, RAVENOUS II will not last long in today’s market. US Duty paid. United Yacht Sales New Jersey would love to guide you through a personal showing of this 82' Oyster 82 Deck Saloon 2007. 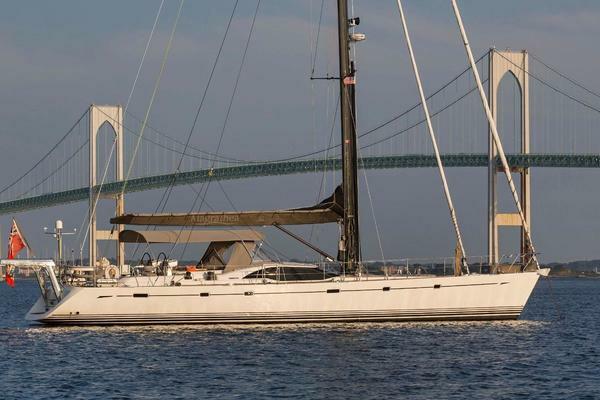 This yacht for sale is located in Jamestown, Rhode Island and priced at $1,790,000. For a showing please contact us by filling out the form on this page and we will get back to you shortly! GENERAL Thirteen berths in five cabins, excluding the saloon - ten fixed berths with additional two stowing pipe berths with 2” mattresses, and one Pullman. Interior joinery finished in maple with inlaid mahogany accents. Designed to be modern and coordinated, whilst remaining practical and durable at sea. Essential features include sculpted fiddles and grabrails, ‘shadow-gap’ joints between panels and Oyster custom knobs for lockers and drawers. GALLEY To port. Generous worktop space and abundant lockers for stowage. Slide-out baskets with sea lock, spice rack and knife rail. Slide-away smoked Perspex pocket door can be used to isolate galley from lower saloon. Creating RAVENOUS II was both a joy and the result of a lot of experience. She was to be our third large fast cruising boat. Having just owned and sailed an Oyster 70 for seven years we knew what we wanted. I was completely satisfied with the basic design of the Oyster 82 as a sailing machine and we were going to make it better. It was meant to be a boat that would allow us to cruise with friends and our very large family. Twin beds and extra berths in each guest cabin was a must. Hot water and air conditioning systems that exceeded any normal specs. We chose the carbon fiber boom and mast because it was both the best sailing option and its lightness would compensate for the shoal draft at 8.5 feet. Growing up in New England and living in the Chesapeake area having a shallow draft was a necessity without compromising the boats sailing ability. We have won more than our share of races and have been named the winner of the Concourse de Excellence on many occasions. Since the boat was based in Annapolis and spent every winter in the Caribbean we build the boat with a fuel capacity to motor the whole way from Annapolis to Antigua if necessary. With the right winds we use hardly any substantial fuel at all. The inside of the boat is the inspired work of my wife. We had to travel to South Africa while we were building RAVENOUS II and she took inspiration on wood treatments from the Mandela suite at the Saxon Hotel just outside J-town. The use of mahogany inset in every drawer or door that opened was a fabulous touch. Along with Jo Humphrey’s design help, she added all the warm and charming touches you see today. The craftsmen in Southampton were impressed with both the special design of the woodwork and that an owner could get involved to that level of detail. It made for a very attractive interior. The design of the galley and the placement of the washer and dryer forward were all my wife’s significant contribution to the building of the boat and have made our life on board all the years better. 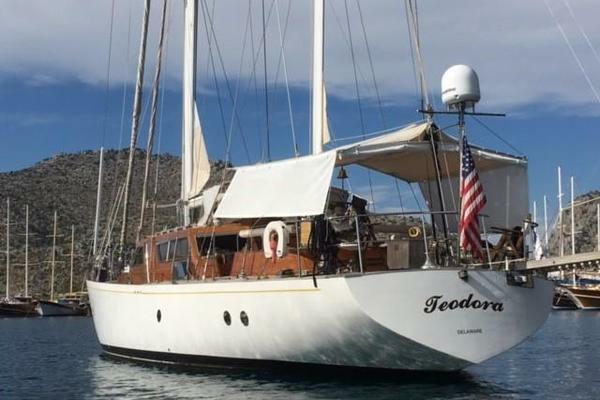 She was intended to be our beautiful and very upscale cruising boat that could work for the two of us or when we added parts or our large family. She succeeded. The boat turns heads in every port – just one beautiful classic cutter. All personal belongings and all other items not expressly listed in the above inventory are excluded from the sale. Interior decorative artwork and scatter cushions are specifically excluded from the sale.